Mrs. Grace Soje, the wife of the Kogi State civil servant, who committed suicide on October 16, 2017, says her husband’s death remains a shock. The widow told Sunday PUNCH that her husband, Edward Soje, showed no signs of depression the last time she saw him alive. Mrs. Soje, who is a federal civil servant, was still in a private Hospital in Abuja when our correspondent visited her on Saturday. Although her husband took his life on October 16, it was learnt that she was only informed of his death on October 31. “I learnt of my husband’s death on Tuesday. I was not even informed because my phone was taken away from me after I gave birth. But on that particular day, I saw my phone lying around and it was switched off. Grace told our correspondent that she saw her husband alive on October 14, during the naming ceremony (christening) of their triplets– Elijah, Elisha and Enoch. She explained that she was the one who asked him to go home to rest and put things in order and then come back to the hospital. We did the naming ceremony at the hospital on October 14 and there was no quarrel whatsoever. We only asked him to go home and rest because the hospital was filled up and the nurses were driving people away. “So, I told him to go home to rest and return in the evening so that we could plan how to move our car and some other things from Kogi. That was the last time I saw him. “On Sunday, we waited for him to come but we never saw him and his phone was switched off. So, my cousin, who was staying with me, went to the house but didn’t tell me anything but she told my elder sister what she saw in the house such as the cardboard where he left a message. 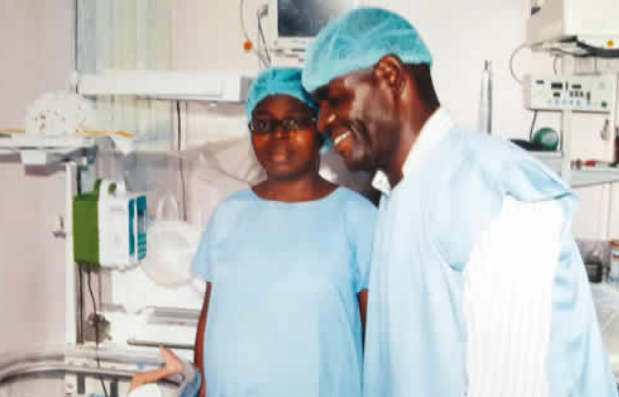 Mrs. Soje said her husband never showed any signs of depression, adding that on the day the triplets were born, he was rolling on the hospital floor thanking God for finally giving them children after over 17 years. She added, “One of the nurses told me that when I was in the theatre and the babies were born, my husband was rolling on the floor, praising God. He bought banana for the nurses. Even my tenants in Lokoja said on Friday, my husband was very joyful and told them that he was going to stay in Abuja for a long time to take care of his children. “We never quarrelled. In fact, my blood pressure was high and he was the one who calmed me down and asked me to rest and keep my phone aside. “He never gave me any sign of anything; nothing! On Tuesday, his nephew, who lives with us and happens to be a civil defence official, called me, saying that my husband came to his house and was saying some things that he didn’t understand. When asked if it was true that Edward committed suicide because he had not been paid by the Kogi State Government for almost a year, Grace said she could not say. She admitted that her husband had not been paid for several months but explained that they were both living off her salary. Making a concerned plea to the Federal Government, the National Assembly, the Kogi State Government and well-meaning Nigerians, Mrs. Soje explained that the hospital bill had run into millions of naira and she needed assistance. She said one of the triplets, Enoch, had been transferred to the National Hospital for a surgery and his own bill was separate.